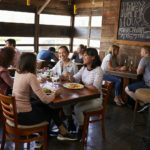 Home / Modern Pest Blog / Bed Bugs In Restaurants? Bed bugs – aptly named, because they most often can be found in beds, where people spend about one-third of their entire day. Which makes sense, because as their primary food source, they want easy, uninterrupted access to their next meal. Ick! Got Creepy Crawlies? Modern has the solution – GUARANTEED! Learn more about our Bed Bug Treatment program! Where bed bugs can be found. The truth is, however, bed bugs are natural “hitchhikers”. And again, as their primary meal, they tend to follow us wherever we might go. They have been found in a variety of places where people spend time congregating, sitting, resting, eating and leisuring. No, this isn’t a game of follow-the-leader, rather bed bugs sneak onto our personal items such as luggage, purses, clothing or other items you may carry. They can end up in offices, buses, movie theaters, hotels, schools, airports, libraries and yes… even restaurants. Before you go into a full-blown panic attack and begin to scratch all over, put your mind at ease with understanding that bed bugs are NOT known to transmit disease. Phew! However, the mental anguish that most folks perceive with a bed bug infestation is very real. For businesses owners, protecting your reputation is essential. Inspect: Early detection is critical in preventing or controlling an infestation. If you, an employee or a client believes they have seen a bed bug, getting an inspection from a pest management professional, will allow you to quickly confirm and treat as needed. Isolate & Treat: Contrary to popular belief, in most cases, it is not necessary to throw away infested items. That said, if you suspect objects may be infested, quickly isolating that area till it can be properly treated, will help prevent bed bugs from “hitchhiking” to new locations. Clothing & linens can be treated by simply drying for 30 minutes on high heat. Furniture should be covered and removed to an unused room, where it can be inspected, treated and cleaned accordingly. Employees: Quickly addressing employee concerns, means having a plan in place that allows your team to take precautions. You may even choose to develop a policy or procedure in response to such a situation. This not only helps with morale but instills trust and confidence in you as their employer. Of course, suggesting team members avoid direct contact with infested areas is recommended. Additionally, suggesting team members perform a bed bug check, much like a tick check, can assure your team that they are not carrying any bed bugs on them. Quickly getting ahead of a bed bug infestation as soon as bed bugs are suspected can help business owners prevent reputation damage, lost revenue and a public relations nightmare. Modern Pest Services offers both conventional chemical bed bug removal and Thermal Remediation® or heat treatment (electric or propane) to its commercial and residential customers throughout New England. At Modern, our licensed and highly trained professionals can customize bed bug treatment plans to meet your specific needs. Additionally, Modern offers canine bed bug inspection services, a faster, more reliable way to detect bed bugs.